Last week I threw a big Birthday party for my husband Nicky Rockets. He was forty (although he still looks extremely baby faced) and I wanted the whole event to be special without being too stuffy. I'm a huge fan of having parties in the home. Blame it on memories of 1970's house parties as a kid but there is something so fantastic about turning your kitchen into party central.It also means people who wouldn't be able to get babysitters or who would be put off by attending a more formal event tend to drop in so you get a great mix of guests. Although I like the atmosphere at my parties to be casual I'm still a great believer in spending the day before planning how its all going to run and in terms of decoration I love to take my time and make the house and garden look really special. As its a party for my husband who I just adore I decided on a heart theme for the decorations. 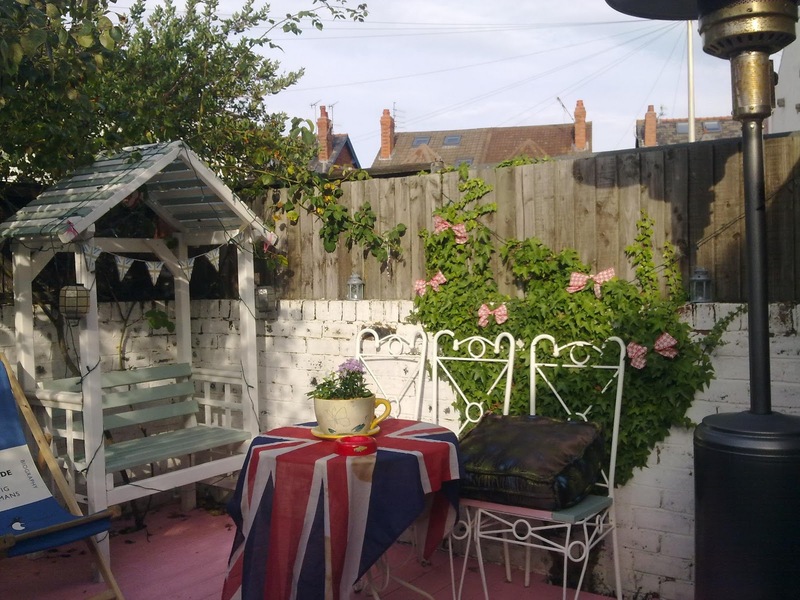 I always ensure the garden is made particularly enticing when we throw a soiree as it encourages people to go outside and stops my fairly small house feeling too packed. My garden is only tiny but you may have seen my previous blog where I transformed it into a corner of vintage loveliness. So it was already looking pretty nifty. What I wanted to do was create little areas to encourage people to stand and chat or sit and have a drink. I brought some old wooden ammunition boxes from a jumble sale ages ago and used them to create different heights for my pots and planters. I made a corner with plants in front of an old fireplace I have propped against a wall and put lovely bright flowers on the crates. Placing lanterns next to them so they would twinkle once the sun had gone down made it look quite magical. 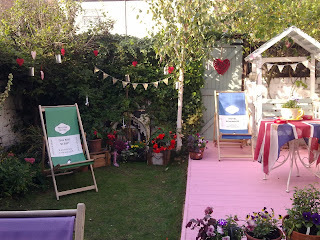 I love to hang bunting and need very little encouragement to tie oodles of the stuff wherever I can and the garden is no exception, carrying on the heart theme of course. You should never take yourself or your styling too seriously. I love a bit of whimsy so when I found some small purple toadstool ornaments I knew they would add just the right amount of Alice in Wonderland chic to proceedings. I'm not a great believer in any restraint so me, my lovely friend Lena and my mum spent a very happy afternoon dangling hearts, lanterns and bunting over every branch, pot and umbrella. Hanging a beautiful wooden heart on the garden gate looked particularly fetching. Inside needed less adornment as my house is already quite bright and colourful. I had a huge banner made for my husband (with a Rock n Roll theme of course) and hung bright red bunting across the kitchen. All in all it looked pretty fantastic and the birthday boy was very happy. Tomorrow I will tell you about the food I made (and the Straycat themed cakes) and the entertainment which was really fabulous.